MOHLTC OHIP Schedule of Benefits and Fees (Effective March 1, 2016 ...as most recently amended Dec.22/15): Download accessible via the MOHLTC website. NOTE: The OMA Tariff Department has also posted a number of Quick Reference Billing Guides on their website. UPDATED: The excerpts below now reflect the non-negotiated, government imposed 1.3% fee reduction that became effective after October 1st 2015 and any subsequent amendments up until Dec.22/15. 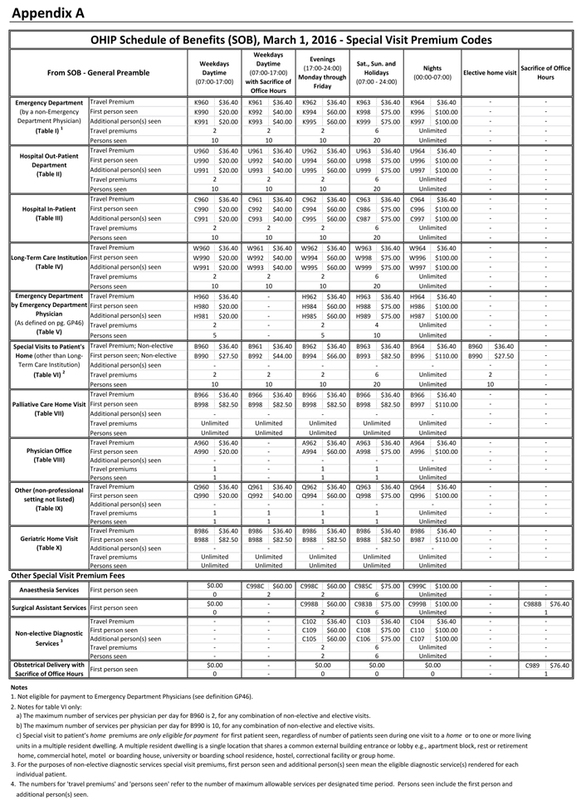 Source: MOHLTC Schedule of Benefits (Dec, 2015); Other MOHLTC Schedules-Documents(current). Billing claims are usually submitted by Electronic Data Transfer (EDT) to your local MOHLTC Claims Services Branch. If you feel a complicated claim is going to require further documentation, make sure to submit/fax it on the same day as the EDT. Be sure to make a paper trail and get confirmation that they received it. Email confirmation is preferred, but if you call, make note of the time, date and contact person in a journal. Cases with multiple procedure codes and duplicate billings are automatically forwarded to a Claims Assessor (other criteria such as billing history may also be used) and will likely be rejected; you'll only be asked to be resubmit the claim with the manual documentation. Save time and delay, and do it the first time! IMPORTANT NOTE: Inquiries regarding overpaid or underpaid claims on the Remittance Advice must be made in writing using the Remittance Advice Inquiry Form. Do not resubmit the claim. Claims under review by a Claims Assessor may require further documentation by the physician. Fax this documentation to the Ministry office where the physician claims services are performed. Ensure that your billing number is clearly labeled at the top of EACH PAGE of your documentation being faxed. ALSO, remember to flag the claim using your billing software to indicate to the Ministry that special attention is required for that particular claim. Phone/email your local Ministry office if uncertain. Once these manual documents are received, your claim is then escalated to an Assessment Officer for further review. If the claim and documentation is still too complex or convoluted, it will be further escalated to a Medical Advisor. Once it's been assessed this time, it will appear on the provider's monthly Remittance Advice (RA) either as full, partial or denied payment. If the claim has been partially paid or completely denied, the surgeon/provider may appeal this by completing what is called a Remittance Advice Inquiry (RAI) (form#1). This needs to be accompanied with a letter, a note and any other additional documentation which may be of benefit. NOTE: Questions to the Medical Advisor should be IN WRITING ONLY. KEEP ALL CORRESPONDENCE for future reference. If this additional letter/document supports your appealed claim, then the claim will be adjusted. If the Assessment Officer or Medical Advisor stand by their initial rejection, then a response will be sent to the provider/surgeon with an explanation. If the surgeon still does not agree, you can appeal one final time with another Remittance Advice Inquiry (RAI) (form#2). This must be accompanied with a formal letter. At this point, it will be escalated a final time to be reviewed/discussed by a panel of three Medical Advisors. All 3 must be in agreement on the assessment. If one of the three advisors does not agree, then the provider's claim is adjusted automatically by default. Time Frame: As a rule, it should take about 1 month for each stage - 3 months maximum for the entire process IF you've been diligent in submitting all documentation promptly. IMPORTANT NOTE: Each physician is responsible for all claims submitted and paid in conjunction with his/her OHIP billing number. So, even if you have a 3rd party submitting your billing, you are still liable for the consequences and fraudulent claims which could jeopardize your license. Be aware of what is submitted under your name and billing number. As such, the MOHLTC recommends that physicians promptly reconcile all claims by reviewing their monthly Remittance Advice and Error Report. COMMON ERRORS RESULTING IN NON-PAYMENT: a) missing/illegible 6-digit billing number, clinic's 4-digit ID number, patient's health card number/info, b) documents sent to the wrong district office, or c) requested documentation is not sent along with the submitted/resubmitted claim. MOHLTC/OHIP Billing Claims Recommendations: •Contact patients for updated information, • Perform a monthly reconciliation of your Remittance Advice and Error Report, • Keep copies of the Remittance Advice, • Diligently follow up all underpaid/overpaid claims, • Retain all Error Reports until claims are paid, • Make corrections and re-submit claims ASAP, • Ensure new billing staff are properly trained. Sources: MOHLTC Health Services Branch/Claims Services Branch (OAGS AGM, 2014), OAGS Billing Corner (Issue #36, 2014). Outline your issues in an email to our OAGS office "Attn. Tariff Committee": info@oags.org . Have a Complaint about your MOHLTC/OHIP Health Claims Services Branch or Your Stale-dated Claim? This Ministry website provides a contact listing for the central Health Services Provider Facility Payment Unit. There are several fee-for-service medical advisors who can assist you. Call initially, but all communications should be in writing (and/or logged). MOHLTC Health Services Branch & Medical Advisory Contacts: www.infogo.gov.on.ca ; 613-536-3164. The OMA Economics & Analysis department can also offer billing advisory and mediation: economics@oma.org , 416-599-2580 / 1-800-268-7215. Do you have a question for our Tariff Committee? Part 1: We believe the correct way is to bill it as you describe, although it is a judgment call whether you cut off at the splenic flexure or hepatic flexure. You bill for the sections visualized, including the terminal ileum, and don’t bill for the sections not visualized. Billing the terminal ileum should mean going several centimeters past the anastomoses - not just looking at the anastomoses. That said, there are a lot of colonoscopies that are billed to the cecum that do not have a cecum, and the ministry billing computer doesn’t seem to have an understanding of colonic anatomy and accepts billing for parts that are missing and does not require all contiguous segments to be billed. There was an issue in the past for some researchers as well as for early versions of the provincial score cards as the algorithms for determining a complete colonoscopy did not make adjustments for the lack of a right colon, and surgeons who have many patients with right colectomies were perceived as having lower cecal intubation rates, when in reality it was just them being honest about their they billing codes. My understanding is that the current score card accounts for the lack of a right colon and does not consider an incomplete colonoscopy in a person with a right colectomy as a true incomplete colonoscopy. At least if you fill out the CIRT tool correctly and they had their right colectomy in Ontario. Our recommendation is that you bill only for the segments visualized. Part 2: That being said, there is the intent of the code as well. It is outdated to bill all of this in sequence. The spirit of the code (could be) "how far did you get"? So, if you get to the "neocecum" after Right hemi, your call to bill to HF vs. "cecum" but you have essentially completed a full examination of the patients colon. I'm not sure CCO has rectified the OHIP vs. CIRT data for its calculations but has done so for our report cards. That being said, I'm not sure every colonoscopy site has to do this as of yet, does it? I would also suggest billing in sequence. If right colectomy, bill to HF. If sigmoid colectomy or left colectomy, thenbill to cecum, all four codes, but again my opinion. In hopefully the not so distant future, we can rewrite some of these codes to eliminate this issue as well as simplify billing. Yes, you can. Make sure you bill the "A" prefix with the visit for all special visits though. Even though an inpatient C035, if special visit also being billed, bill the A035. As well, you need to travel to bill a special visit during the day. (i.e. you can't bill a special visit during the day if you don't have to travel to see the patient.) They need to be billed together. I believe the same is true for sacrifice of office hours as it is the same time frame - if rendered during daytime hours (07:00 - 17:00 hrs Monday through Friday) in circumstances in which a travel premium is eligible for payment. (General Preamble 45) Sacrifice of office hours means an insured service rendered when the demands of the patient and/or the patient's condition are such that the physician makes a previously unscheduled non-elective visit to the patient at a time when the physician had an office visit booked with one or more patients but, because of the previously unscheduled non-elective visit, any such office visit was delayed or cancelled. (General Preamble 44) So, if you had to travel to the hospital to see a patient and sacrificed office hours to do so, you could bill the visit, the travel and the special visit premium. Q. How do you bill as both an assistant and as a surgeon for an elective surgical case that after 3 hours' delay gets cancelled? A. Rules are the same for both. Surgeon - Surgical Preamble, SP6 section 27. If cancelled prior to induction, bill a visit. If cancelled after induction and while scrubbed, bill time plus 6 units. Assist - General Preamble GP57. Same...Pre-induction: visit. Post and scrubbed: time +6 units. 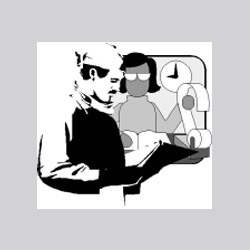 The "Surgical Assist Standby" only applies to a delay longer than 30 minutes, but surgery is performed. If cancelled altogether, then previous rules apply. A. Yes, you can bill TPN fee code during the first 14 days post op. The fee code descriptor is specific that it cannot be billed in addition to hospital visits. A hospital visit pays slightly more so it makes more sense to bill a hospital visit if the patient is not within 14 days of Non-Z code surgery. A. You cannot bill an assessment A034 along with the assist codes. The assist codes include any assessments, attendance, assistance perioperatively that my be required. A. I would try # R517- Excision of foreign body .. $107.70, Page N3 under wound care. I can’t see anything in the description that would preclude it. A. For out-of-province patients, except Quebec, your billing program will bill the province directly. You just need to enter the province code in the appropriate spot (BC in this case) and their provincial health number. They will pay Ontario rates (except Quebec) for your billed services. For Quebec, you need to fill out a paper form. A. The code description for TPN G510 is explicit: you can’t bill it with visits. "For Management of parenteral alimentation: In addition to the common elements, this service includes the specific elements of assessments (see General Preamble GP11). Not to be claimed in addition to hospital visits." You have to choose between billing TPN or visits. For day 2 -14 post op, you can’t bill visits, so bill TPN, but after that, visits pay more so bill visits. Some larger centers with shared or group practices designate one member of a group to do surgical nutrition rounds and order TPN but that is stretching things a bit. Would suggest just billing the visits and forgoing the TPN billings. The short answer can be found in the Schedule of Benefits on page SP2 (surgical preamble) subheading 6. Claim the benefit of the procedure you performed, not the basic units assigned for the procedure you are assisting for, but may claim time units for assisting (other than the time you spent doing the EGD). A. The "rules" are outlined on page Q14 of the Schedule of Benefits (SOB). If the patient meets those, you can bill for the listed procedures. The sclerotherapy codes are on page J44, code G536. Again, they come with criteria (>5mm vessels), which may not apply to spider veins. Outside of those parameters, I don't think there are any other ways to bill it other than privately. A. According to the OMA, "the Ministry has identified that the cause is related to system modifications that support changes to reduce the number of surgical adjudications subject to manual review. These system changes have reduced the volume of claims subject to manual review but resulted in this subsequent unintended consequence. The OHIP Schedule of Benefits states that when a procedure is carried out by a surgeon within 14 days during the same hospitalization for the same condition, then 85% of the listed benefit(s) applies. Further, when a subsequent elective procedure is done for a different condition within 14 days during the same hospitalization by the same surgeon, the benefit for the lesser procedure shall be reduced by 15%. However, the OHIP Schedule allows for the full benefit to be paid when a subsequent operation for the same condition becomes necessary because of complications, or for a new condition. Likewise, the full benefit applies when a subsequent non-elective procedure is done for a new condition by the same surgeon. The Ministry is working on a solution to address these rejections and will advise when it is in place. In the interim, in situations where a subsequent operation is rendered and the full benefit should apply, physicians should flag the second incoming surgical procedure for manual review with an explanation that the subsequent operation is due to a complication or a new condition. This will avoid the automated discounting of the claim. Please note that due to manual processing of the claim, payment may be delayed." Refer to the IFHP Information Handbook for Health Care Professionals to find out how to submit the registration form to become a Medavie Blue Cross registered provider. To ensure reimbursement for your services or products by the IFHP, you must verify that a patient is eligible for IFHP with Medavie Blue Cross before providing a service or product each time you see that patient, as a person may cease to be eligible or have their coverage changed at any time. •Log into the secure section of the provider web portal. Note that it takes at least two business days for coverage to be activated in Medavie Blue Cross’ system after it is issued by CIC. You must not charge beneficiaries for services or products covered under the IFHP. You must directly bill the IFHP through Medavie Blue Cross. Claims can be submitted electronically via the provider web portal, by mail or can be faxed to 506-867-3841. Ask patients if they are eligible for any other private health insurance program or plan that covers the service or product. If the patient has another plan or program, you cannot be reimbursed by the IFHP. Find out more about IFHP coverage types. See the Medavie Blue Cross Provider Portal for benefit grids for each coverage type. See the Relativity Section here.